The standard main dish is rice and curries made with meat, fish or vegetables and flavoured with a blend of spices. Hoppers or pancakes of rice flour and coconut milk. There is an amazing variety of tropical fruits to sample. Try custard apples, rambutan, mangosteens, mango, jackfruit and many varieties of dwarf bananas. Coconut is a major feature of Sri Lankan cuisine using the flesh, milk and oil. 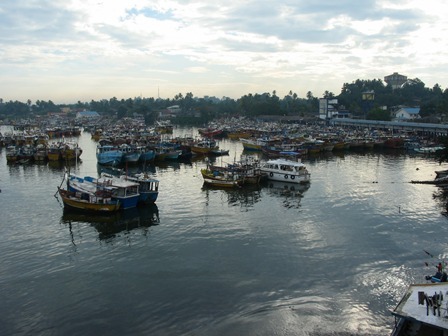 The sap known as toddy, once distilled becomes a hard liquor, arrack and is the national spirit. The sap is also boiled down into an unrefined sugar, jaggery, used to sweeten tea. The juice of the king coconut is a health drink. Only drink bottled water which is widely available and check the seal is unbroken. Tea is another famous export of Sri Lanka and a trip to the tea plantations and factories is a must. Local brewed beers e.g. Lion are good alternatives to the expensive imports. 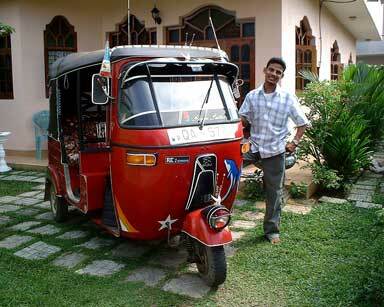 Three wheeled taxis or tuk-tuks are the cheapest and best way to travel in the towns and villages. There are always plenty around, check the price before hand and have the correct money ready. Buses can be overcrowded, slow and hot. The drivers barely stop long enough for anyone to get on or off. The private bus companies run intercity air-conditioned seated buses. You can rent and drive your own car but it’s not recommended. It’s much easier, safer and stress free to hire a car or mini bus with driver and / or guide. Vehicles drive on the left hand side in Sri Lanka. Train fares are low and most have only 2nd and 3rd class. Some express trains carry special observation cars with seats that can be reserved in advance. You can bring in as much foreign currency as you want. Local rupees cannot be brought into the country. Traveller’s cheques are a problem to cash, it is better to use ATM cash machines, which you can find at most large towns, with a card which works on the major networks e.g. Visa. The daily withdrawal limit is 20,000 rupees. Currency can be exchanged quickly at the airport, make sure you obtain some small notes e.g. 50’s and 100’s for tipping etc. Changing money in the banks is a slow process, hotel exchanges are quicker but the rates may not be as good. Sri Lanka uses round pin plugs and runs at 230-240 volts. If your mobile phone is not locked then it is a good idea to buy a local Dialog GMS SIM card as this has the widest coverage in Sri Lanka. There are two main monsoon seasons, the southwest monsoon is from May to September and the north eastern is from November to May. The southern coast has an average temperature of 27oC (81oF). The central highlands are cooler, between 20oC (68oF) and can be quite chilly in the evenings. The official languages are Sinhala, Tamil and English. Most people are Buddhists and there are many ancient temples but there are three other major religions – Hinduism, Christianity and Islam. When visiting a Buddhist temple remove your hat and shoes, legs and shoulders should be covered. Donations are expected so leave some money in the collection box or hand it to the official guide. 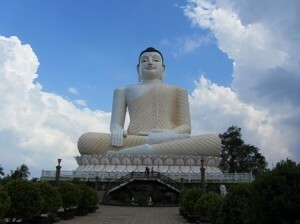 Do not take photos with your back to a Buddhist statue or image. Always give, receive and eat with your right hand. Also avoid waving or gesturing with your left hand as the left hand is used for “toilet duties”. It is thought on as rude to blow your nose in public. If you are invited to someone’s home take a small gift such as cake, flowers are not thought of as a gift.